Star Trek Prey concludes! Enter... The Hall of Heroes! The quest is complete! 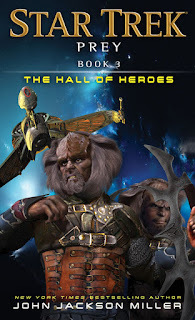 The third book of my monthly trilogy for fall, Star Trek: Prey - The Hall of Heroes, is now on sale everywhere in paperback and e-book form. My first Halo comics appear in Tales from Slipspace! Halo turned fifteen on November 15 — so it's fun to be right there kicking off Year 16! 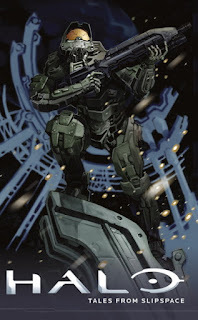 I'm delighted to announce that my first Halo comics story has just arrived in comics shops. The Halo: Tales from Slipspace hardcover contains "Undefeated," a post-Halo: Guardians story by myself and artist Eric Nguyen — with colors and letters by my Knights of the Old Republic colleagues Michael Atiyeh and Michael Heisler. You can find the book at your local comics shop — or at Things from Another World. It will also be available on November 29 from Amazon and in your local bookstore. And you can get signed copies from me now at my shop. Fractures: Extraordinary Tales from the Halo Canon. Now available as well in audiobook! 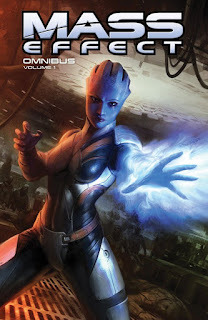 One more video game comic offering to report on: while it releases two weeks later in the mass market, comics shop patrons today can get the Mass Effect Omnibus Vol. 1, which contains the first three graphic novels I did for the series, Redemption, Evolution, and Invasion. That one's also from Dark Horse Comics. Next signings for me are at House of Heroes in Oshkosh, Wis., on November 19 from 1-4 p.m. Then I'll be in Fort Lauderdale, Fla. December 9-11 for Paradise City Comic Con. Look for me at the Wordfire Press booth.